Tuesday, March 9th marks the 100th birth anniversary of American composer Samuel Barber. 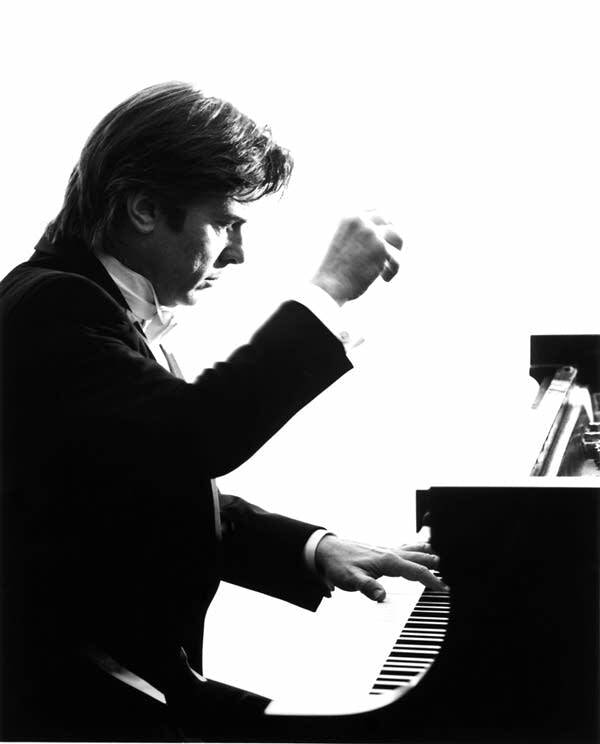 Pianist Robert DeGaetano, who made his performing debut in St. Paul, MN in the mid 70's, met Barber as he was preparing to perform the composer's piano sonata at Carnegie Hall. They became lifelong friends. Classical MPR's Julie Amacher spoke with DeGaetano about Barber; the man, and the musician. I was getting ready to do my New York City debut at Tully Hall in '75, and a friend of mine, Bobby White, the great tenor, said "You really have to meet Sam." In my New York debut I was gonna play the Samuel Barber piano sonata, the great sonata he wrote, and so they arranged for me to meet Samuel Barber, which was phenomenal. I had this incredible experience of playing for him, playing the sonata for him, and he actually came to the debut at Tully Hall, at Lincoln Center, and we became very close friends for those five years that he lived after that. Well, he was quite an extraordinary guy, because he used to do some funny things. Like, he would take his finger and he would put notes on a page in the air, as though he was composing. And I'll never forget, I was with him one night, and my parents, we had gone out to have an Italian meal. My dad was driving, and Sam was in the back of the car humming with his finger in the air, kind of composing at the same time. And my dad said, "What are you humming? ", and Sam said "Oh, nothing that important." My dad said, "You better be careful, somebody's liable to steal it." My dad always had a way with him that was really cute, and Sam loved it. His music was always...no matter how contemporary he tried to be, it was always lyrical. And I believe it came from his vocal sense, his understanding of the voice. He had a beautiful tenor voice. He had a great understanding of how to be lyrical at the piano, not make the piano sound percussive and ugly. But his writing always leaned toward the lyrical, and I always found that very attractive, and my own music is very passionate and in a certain sense romantic, and I'm sure he influenced that a great deal. The story behind the "Adagio for Strings"
He was in school...he was 18 when he wrote that, and it was a string quartet, and it was the second movement of the quartet. That summer, he and Gian Carlo Menotti, they were close friends at the time, and they went to Italy that summer, and Gian Carlo said "You have to bring this music to Toscanini." So what they did is they went to Lake Cuomo and they hired a rowboat, and they took the score and they rowed across to Toscanini's chateau, and they put this music underneath his door. Well, back in America, about eight months later, Samuel Barber was contacted by the head of the Curtis Institute and was told that Toscanini wants to meet him. He decided that he wanted to turn the Adagio for Strings into a string work rather than just a quartet. And actually that's what put Samuel Barber on the map, because it was performed the next season. The piano concerto was a great success, with John Browning...he played it magnificently. And they were very close friends as well. John was at the hospital a few days before Sam died, and we actually performed for him. Gian Carlo Menotti was there, and he had arranged for them to bring a piano to the hospital, and a few of us performed for him that day. And he would make comments that I always found very interesting. One of them was "Why repeat something? If they didn't hear it the first time, it's their problem." Now, those kind of comments sound like they're nasty or they're slightly abrasive, but I could understand his concept with that, because often when things are repeated, they're not repeated in a way that enhances something. His music is almost never repeated. Even sequences are quite often changed, which is, kind of, you know, funny. As a composer, he was unique...he just said what he wanted to say, and he said it concisely, and brilliantly, and totally from his heart and his mind in a clear way. And that attracts people to it, because it's honest. There is tremendous integrity in that. And aside from the beauty, I mean, there's a lyricism as I said earlier, in almost everything that he's written, but one sometimes has to search for that lyricism. For example, in the fugue of the piano sonata, which at first seems just horrendously difficult and very abrasive, it's a very long theme. After awhile you begin to realize how it's just totally perfect and it's organized in such a way that it's completely lyrical. The slow movement is a very interesting movement in that Sam was at the time experimenting with twelve-tone music. And I always find it fascinating because every time people mention twelve-tone music of course they think of Schoenberg. Sam could not write something that was not lyrical. In the first two measures of that movement, you have all twelve tones that we have in Western music. They're spread out in such a way so that they're played two notes in each chord. Two notes in the left hand, two notes in the right hand, back and forth until you have all twelve. Then from then on the entire movement is built on those twelve tones, but it's built in such a way that's so beautiful and so lyrical that you don't know it, [you don't know that] you're listening to a twelve-tone piece.